I have mentioned my love of reading before and you already know how much I love junking. So, when I found out about a series of novels based on a character who is a junker on Sue's blog, I just had to find out about them. The books I'm taking about are by the author Mary Kay Andrews and they are called Savannah Blues, Savannah Breeze and Blue Christmas. If you can, read them in that order as it will be easier to follow the characters and story line. I of course read them out of order, but still enjoyed them immensely. 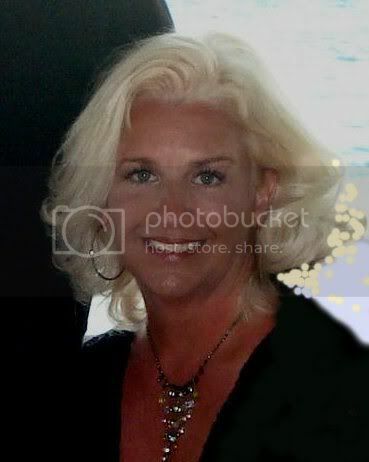 Mary Kay Andrews has her own blog as well and is a self proclaimed "Junker." My kind of gal for sure! Yesterday Isabel and Joy came over to work on projects and have a little lunch. 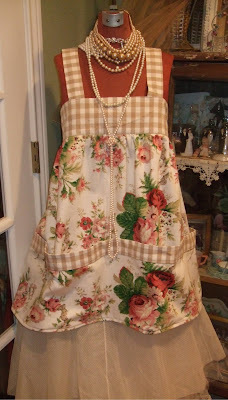 Joy and I decided to make an apron while Isabel ironed some of her vintage linens. 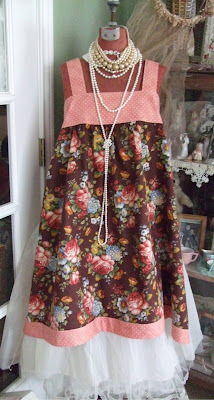 The aprons we worked on were from a pattern Joy brought with her that I absolutely loved. It took me all day to finish my apron, but I loved how it turned out. Joy has some pictures on her camera that I'm sure she will show on her blog. Her apron was adorable made from the cutest vintage ballerina drapery fabric. Today after dropping off the kids at school, I decided to do a little thrifting and headed down the road to Goodwill. I was so disappointed when I got there and found out that they have changed their hours and now open at 9am (instead of 8am) so I just turned around and went home. Since I still had all my sewing stuff out, I decided to go ahead and make this. This one is a little different than the one I made yesterday. No pockets and the fabric is lighter weight. I'm going to just wear this one like a smock over a white t-shirt and jeans. This one only took me a couple hours to make instead of the whole day. Now I want to make a bunch more. They are so fun and easy to put together when you finally figure it out. Finally, here is a little something I want to show you. To thank me for inviting her to Thanksgiving dinner, Isabel gave me the sweetest little card with a hand painted rose on it. 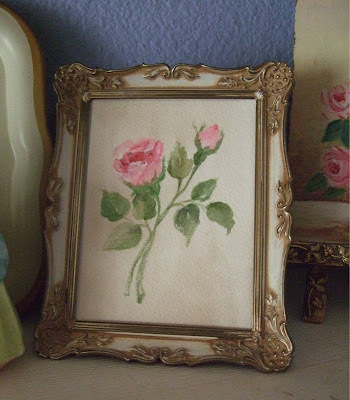 I dug through my stash of vintage frames and found a perfect one to hold the little painting and now it sits proudly on my little shelf in my bedroom with my other mini rose paintings. I just love it! Wishing you all a very happy Thursday and a great weekend! Those aprons are soooo cute. How do I get one???? Lisa, the aprons turned out darling! And that frame is perfect for the little painting!!! Loved being there yesterday, thanks for feeding us, too! I love roses too and that picture is very pretty..I love the frame! those are like the most darling frocks and aprons i've seen. easy for you....i can't even thread my machine. you have mean talent!!! you and isabel both...i love the way you dressed your new girl form. love the pearls!!!! way cute. I'm moving to Portland! I'm going to show up on one of you girls door step, bags in hand, screaming outside the door.......I'M HERE, I'M HERE OPEN UP, YOUR NEW BEST FRIEND HAS ARRIVED! I love those books too. I also read them out of order, but still enjoyed them. I loved how she was always going to estate sales etc. Didn't know the author had a blog- will have to check it out. Cute aprons..you have been a busy gal! OMG your aprons are totally cute! I love the coordinating big gingham you used on the first one - darling. Hmmm those books sound like a fun read. We're headed to Maui on Sunday - I need some reading material! It looks like you had a fun day! I bet those aprons would look cute with jeans and a tee-shirt. I was so dissapointed when I found out that Goodwill isn't opening until 9:00 either. I use to be able to hit it before going to work, now I can't! Boo-hoo! I just love reading about all that you guys do together...Such fun, creative times! I love those aprons...cute and practical! This has to be the most darling apron pattern I've ever seen!!!! Would it be rude to ask where it came from? This has to be the cutest apron I've ever seen! Would it be rude to ask where the pattern came from? If it is rude, where can I get a finished one? :) TOO CUTE! How wonderful to have like minded friends to hang out with and work on projects! That is a dream of mine as all the people who "get" me are online. I bet it was a wonderful day. Come for a visit. Love the pretty aprons you made! The aprons are great, love the material. But the frame and picture are just wonderful, really pretty. I LOVE the apron too - would love to know what the pattern is also! It would fit my "non-hour glass" figure so much better than the ones you usually see! I love it! Thank you Lisa. Whew. I sure get myself in some fixes. I just found your blog through Dolly's, I love pink Roses too!! Your aprons are beautiful, I really need to get back to crafting and doing new projects. I love visiting blogs like yours it's so inspiring. I have a box of pinky rosy paper stuff to send you...or I could leave it for you on my next trip to Monticello. Let me know your preference...Happy New Year! I love the aprons! You mentioned it was from a pattern. Do you mind to share who makes the pattern? I'd love to have it so that I can make one, too! Thanks so much for sharing the photos!! Love those smock type aprons! Do you happen to remember what the pattern number is? Thanks!